100% PURE ALL-NATURAL ROSE WATER. And nothing else. No Chemicals or Preservatives. THE ULTIMATE SKINCARE TONIC. Quality Rosewater is a treasured skin tonic that lightly cleanses, tones, soothes, heals, hydrates and protects your skin and hair. HOW IT WORKS. 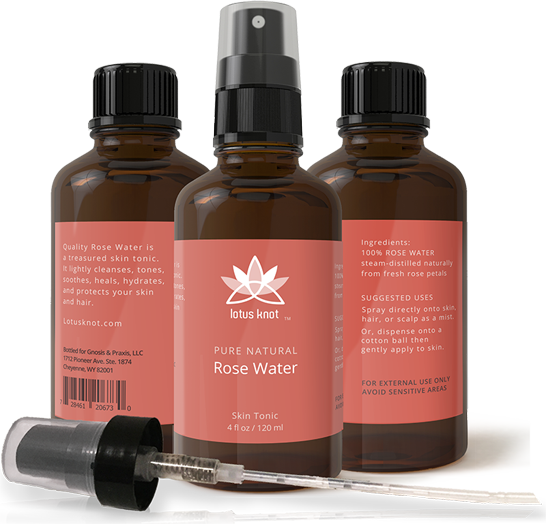 Rosewater has natural anti-inflammatory, antibacterial, and antiseptic qualities. It’s known to stimulate blood circulation, balance the skin’s pH levels, and soothe the skin, as well as boosts collagen which can improve skin texture and help hair to become stronger & shinier. WHY IN DARK GLASS? It protects the rosewater from light, preserving the compounds that have these wonderful effects. And, glass is non-toxic. GUARANTEED QUALITY. This Therapeutic / Spa Grade Rose Water is steam-distilled naturally from Non-GMO Bulgarian Damask Rose petals of the finest quality. In the unlikely event that this precious water does not meet your expectations, LTK’s policy offers you a “30-day Guarantee”. Learn about the history of Rose Water in our first blog article Rose Water Through Time. Ingredients 100% Pure Rose Water, steam-distilled naturally from Non-GMO Bulgarian Damask Rose petals of the finest quality (Rosa Damascena). What is it exactly? Rose Water is a Hydrosol, which is produced from steam-distilling organic plant materials. This process causes the glands of the plant to release their essence. The oil from the plant then rises through a condenser and collects in a separate vessel, leaving a fragrant water filled with goodness in a form that is mild to the skin. About Scent Too mild to be considered a perfume, this rose water has a light scent. You may notice this faint scent vary as it interacts with your unique skin chemistry from day to day. Suggested Uses Spray directly onto skin, hair, or scalp as a mist. Or dispense onto a cotton ball then gently apply to skin. For external use only. Avoid contact with eyes and other sensitive areas. Cap & Spray Top Bottled with a regular cap, we include a Fine Mist Spray Top so you can choose which suits you best. Note, when first installing the spray top, it takes a number of pumps to get the fluid into the stem before you get a clean full spray experience. The Rose is known as Queen of the Flowers, providing overall healing benefits to mind, body and spirit. We hope you enjoy the bounty this long-treasured tonic can bring. Note: Our products are not intended to treat, cure or prevent any disease. Consult your doctor to diagnose and treat any disease or disorder. Always read and follow the instructions on the label before using any products. There is no guarantee for results, only quality.